​Many of the minor deities of Greek mythology were grouped together to give rise to such famous collectives as the Muses or the Hesperides. Such groupings remain famous today, but the individual deities are forgotten. This is the same with another famous group from Greek mythology, the Charites. 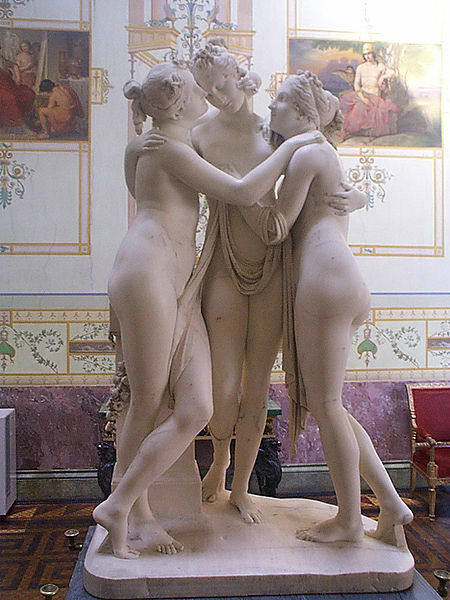 The Charites were minor goddesses in Greek mythology, with the Roman equivalent being the Three Graces. The Charites were generally considered to be the immortal daughters of Zeus and Eurynome. According to Hesiod, the Oceanid Eurynome was the third wife or consort of Zeus, before the god was married to Hera. Occasionally Hera was named as mother of the Charites, and Dionysus as the father. The Charites were connected with festivities, and were vital to a good time at such events. Nominally there was said to be three Charites, three being a common count for such groups, but ancient sources would name far more than three goddesses as Charites. This would give rise to the belief that there were two groups of Charites, the Elder Charites and the Younger Charites, in much the same way as the Muses were split into different groupings. Hesiod, in the Theogony, named three Charites, Aglaea, Thalia and Euphrosyne. Of these three Charites, Aglaea, also referred to as Charis, was the youngest, and her name that can be translated as beauty, splendour or glory. The Charite would be named as wife of Hephaestus, the metalworking god. Thalia’s name means rich banquet or festivity. It is a common name in Greek mythology though, and a different Thalia is also named as one of the Younger Muses. The third of these Elder Charites is Euphrosyne, a name that means good cheer or mirth. Additional Charites are named by such writers as Homer and Pausanias, and these Charites would become collectively known as the Younger Charites. These additional Charites include Anthea (Blossom), Auxo (Spring Growth), Cleta (Fame), Eudaemonia (Happiness/Prosperity), Euthymia (Contentment), Hegemone (Queen), Paedia (Amusement), Pandaesia (Banquet), Pannychis (Night festivities), Pasithea (Relaxation), and Phaenna (Radiant). The general role of both sets of Charites was to spread goodwill, pleasure and mirth throughout the ancient world. 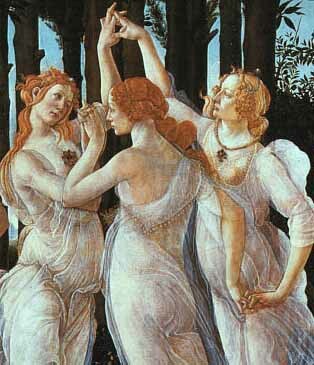 These goddesses were also goddesses of song and dance, a role that would overlap with that of the Muses. In Greek mythology, the Charites were most commonly mentioned in terms of being the attendants and companions of other Greek gods and goddesses. As a result, the Charites were commonly found in the company of Aphrodite, Hera, Apollo and the Muses. The most famous Greek myth concerning the Charites, or at least one of the Charites, was a story involving Hera, Hypnos and the Charite Pasithea. Hera, being angry with Zeus, as often occurred, went to Hypnos in order to convince the Greek god of Sleep to put her husband into a deep slumber. Hypnos would not do it willingly, but when Hera offered up Pasithea as a bribe, with the Charite becoming wife to Hypnos, the god of Sleep did agree to help Hera.